Nearly five million viewers tuned in for the World Premieres of a pair of Hallmark Channel Original Movies: “A Valentine’s Date,” Friday, February 4 (9 p.m. ET/PT, 8C) and “Smooch,” Saturday, February 5 (9 p.m. ET/PT, 8C), respectively, as the network’s “Countdown to Valentine’s Day” heated up the ratings race for the first weekend in February. 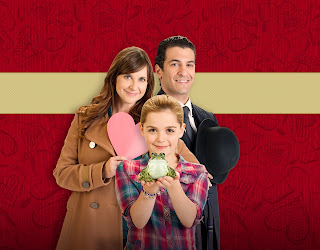 Hallmark Channel leads all other networks in original movies pegged to holidays. “Smooch,” starring Kellie Martin, Kiernan Shipka and Simon Kassianides courted more than 3.1 unduplicated viewers (P2+), achieved a 1.8HH rating, andrankedas the #1 rated ad-supported cable movie of the dayand the #3 movie of the week. “Smooch” also ranked as the #3 rated movie of the day among W25-54. Two-time SAG Award-winner Shipka, who has already won audiences over as Sally Draper on “Mad Men,” stars as Zoe, a young girl who is shocked when she thinks she has turned her science lab frog into a prince (Kassianides) with a simple kiss. Convincing her mother (Martin) to hire him as her new nanny, Zoe tries to bring her favorite fairytale to life and convince her mom to fall in love with the mysterious prince before Valentine’s day—and before his true identity is revealed to everyone. “A Valentine’s Date” was seen by nearly 2.7 million viewers (P2+), achieved a 1.6HH rating, and ranked as the #2 rated ad-supported cable movie of the dayand also as the #1 ratedmovie of the day among W25-54. The ensemble romantic comedy about a Valentine’s Day custody hearing which causes a couple in the midst of divorce to think about what’s most important in life (their daughter), becomes the catalyst to heal the broken family before it’s too late. “A Valentine’s Date” starred Elisa Donovan, Brad Rowe, John Schneider, Tracey Gold, Fred Willard, Tom Skerritt and Catherine Hicks. five-time Golden Globe nominee Marilu Henner and four-time Emmy Award nominee Fred Willard. Hallmark Channel, owned and operated by Crown Media Holdings, Inc., is a 24-hour basic cable network that provides a diverse slate of high-quality entertainment programming available in high definition (HD) and standard definition (SD) to a national audience of almost 88million subscribers. The top tier program service is distributed through more than 5,450 cable systems and communities as well as direct-to-home satellite services across the country. Hallmark Channel is the nation’s leading network in providing quality family programming with an ambitious slate of original TV movies, general entertainment and home and lifestyle content. Hallmark Channel’s sibling network is Hallmark Movie Channel, also available in HD and SD, which focuses on the family-friendly movies with a mix of classic theatrical films, presentations from the acclaimed Hallmark Hall of Fame library, original Hallmark Channel movies and special events.